New bookmaker Tipbet has just launched eSports betting and you can get €5 free bet with no deposit required! Available to New and existing customers! 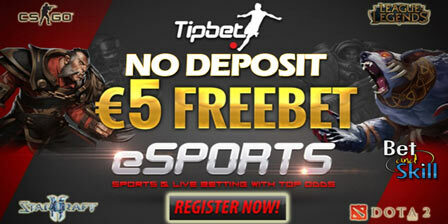 Join via our special links and claim your €5 eSports no deposit free bet right now! Do you like eSports? Get a no deposit bonus to bet on League of Legends (LoL), Starcraft II, Counter-Strike: Global Offensive (CS:GO) and Defense of the Ancients 2 (DotA2) with Tipbet. Furthermore, live betting will also be made available for DotA2 matches very soon. 6. Enjoy the action with Top Odds on eSPORTS such as CSGO, League of Legends, DOTA 2, CoD and Starcraft! The five Euro (€5) bonus will be credited to customer’s account by entering the code "5ESPORTS" at the Offers section under Account Summary. What are eSports and How to bet on eSports? 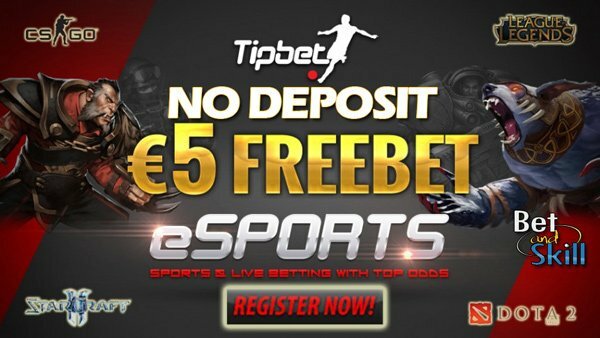 "Get a €5 no deposit free bet on eSports with Tipbet"